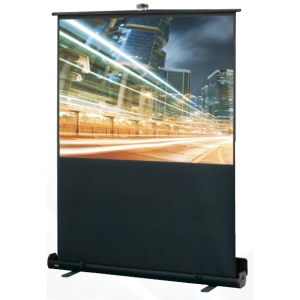 Traveller portable projection screen. Self-contained in an extruded aluminum case. Easy to carry. Durable. Built-in carrying handle. Shoulder carrying strap also included. Telescoping support twist locks to position screen at desired height. Clean, simplified design. Now available in 16:10 and 15:9 laptop presentation formats Only weighs 14 lbs. (6kg) (50" 127cm)) Includes 3/4" (19mm) black borders and 30" (76cm) black "rise." Standard surface specifically designed for today's computer presentations and high resolution requirements. Warranted for one year against defects in materials and workmanship. Optional Padded Carrying Case—Tough, flexible, but lightweight.